Beginning February 1st employers must post in the workplace their OSHA Form 300A ( Summary of Work-Related Injuries and Illnesses). The completed summary must remain posted through April 30, 2019. 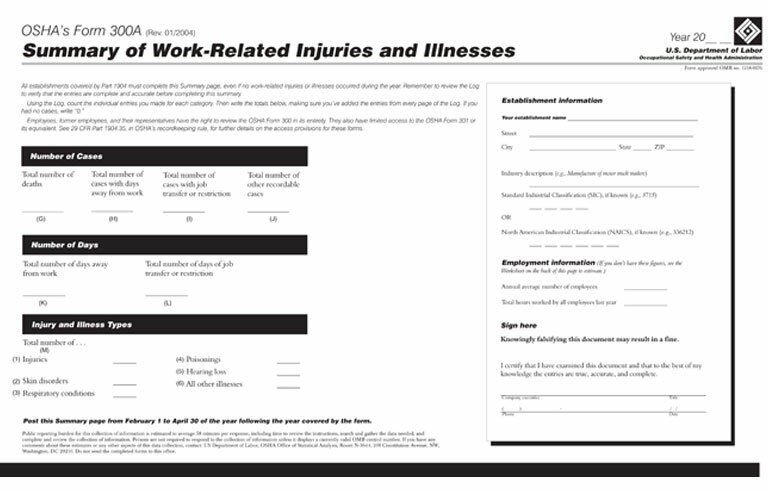 Form 300A summarizes work-related injuries and illnesses recorded in 2018. OSHA states that the summary must be posted in common work areas where employee notices are customarily placed. The agency notes that employers with 10 or fewer employees or who work in certain low-hazard industries are not required to post the summary. According to the OSHA website, under OSHA's recordkeeping regulation, certain covered employers are required to prepare and maintain records of serious occupational injuries and illnesses using the OSHA 300 Log. This information is important for employers, workers and OSHA in evaluating the safety of a workplace, understanding industry hazards, and implementing worker protections to reduce and eliminate hazards. Second, establishments in certain low-hazard industries are also partially exempt from routinely keeping OSHA injury and illness records. Due to changes in OSHA’s recordkeeping requirements that went into effect Jan. 1, 2015, certain previously exempt industries are now covered. See the lists of both exempt and newly covered industries for details. The previous list of partially exempt industries was based on the old Standard Industrial Classification (SIC) system and injury and illness data from the Bureau of Labor Statistics (BLS) from 1996, 1997, and 1998. The new list of partially exempt industries in the updated rule (link) is based on the North American Industry Classification System (NAICS) and injury and illness data from the Bureau of Labor Statistics (BLS) from 2007, 2008, and 2009. Learn more about OSHA's Recordkeeping Rule and who keeps records. If you have any questions or need OSHA recordkeeping training please contact SafeLink Consulting or visit our website to learn more about how we can help your business. Learn more about the OSHA recordkeeping rule by taking our compliance training courses. The course titled, Implementing the OSHA Recordkeeping Requirements, details the revisions to the requirements for reporting work-related fatality, injury, and illness information to OSHA, how to distinguish a recordable/reportable event, and how to properly complete the required documentation. Need help in writing your employee safety policy? Contact an OSHA compliance consultant. Need help in meeting other compliance regulations? Contact SafeLink Consulting for assistance. New online compliance courses are continually added! Get notification when new regulatory compliance training courses are added plus upcoming events by subscribing to our email news. Dental compliance for the dental practice and the dental lab - workplace safety training, infection control training and HIPAA training online, quality systems lab, manufacturing custom implant abutment, gmp for medical devices manufacturers including the dental lab, and need for 510k consultants. Dental practice consultants. Beverage compliance for brewery safety and cidery OSHA safety - OSHA training requirements, quality system consulting and implementation of current good manufacturing practices for beverage manufacturers to ensure that your business is doing the best it can to provide products that are both healthy and safe for the public. General industry compliance - our OSHA compliance consultants and FDA compliance consultants are ready to assist you and your business.